A lot of companies are seeing their destinies rewritten in the course of today’s DreamForce keynote session this morning â and I’m not talking about customers looking ahead to transforming their business operations, though that might be the topic of a future post from DreamForce this week. No, I’m talking about the startups and enterprising small cloud vendors that are having their business models trashed as Marc Benioff throws Salesforce.com’s cloud platform weight around. Let’s skate rapidly past the roadkill that is Yammer, facing a hollowing-out of its still-nascent revenue potential by the unveiling of Chatter Free. What I’d like to focus on are the literally hundreds of small vendors around the world who for the past decade have built strong businesses providing web-hosted database and application development platforms. Many of these minor platforms have existed long before the term PaaS existed, and I’ve written about several of them here and elsewhere over the past few years. 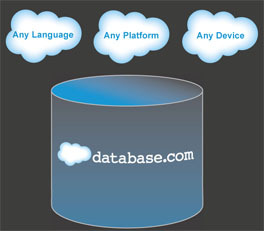 Today, however, they wake up in a harsh new competitive landscape with the announcement of Database.com, the new database-as-a-service platform announced this morning by Salesforce.com. Most of the instant media coverage and commentary this morning has centered on the supposed tussle between Salesforce.com and Oracle. Salesforce-Oracle rivalry heats up with launch of Database.com writes my ZDNet colleague Sam Diaz. That’s hardly surprising given how much Marc Benioff and Larry Ellison have personified the rivalry between their two companies. But while these two database giants lumber around attempting to land punches on each other, it’s innocent bystanders who risk getting crushed â longstanding online database platforms and situational app builders from Caspio to Intuit QuickBase, from Longjump to WorkXpress, and many others. Now of course these vendors will argue that they have many features they’ve developed over the years that Salesforce.com doesn’t offer. In fact, I’ve emailed quite a few of them for comment and anyone else is welcome to add their views using Talkback below. I’ll be interested to hear what they have to say. Of course they have established customer bases who will remain loyal, and which they will continue to serve, for many years to come. But the impact of Database.com on their ability to attract new prospects must be highly damaging. That’s certainly the reaction of Matt Robinson, CEO of Rollbase, a PaaS startup founded a couple of years ago, who I emailed today for comment. “Regarding the impact of this on Rollbase and others like LongJump, we will likely feel it in the form of less prospects for our respective hosted offerings,” he told me. Indeed, the momentum of Force.com has already pushed Rollbase towards providing its platform as an installable package for use by ISVs or within individual enterprises. Naturally there are still questions to be answered about Database.com, which is not entering general availability until next year. “How will transaction speeds and latency affect composite apps built with this as the DB layer?” wonders Robinson. And of course there is the fear of lock-in that is driving many of Rollbase’s customers to want to deploy the platform themselves rather than trusting to a provider’s cloud. A lot of PaaS vendors will be pondering those questions today, and whether they’ll be able to survive the competition that Database.com brings to their market. And that’s before the double whammy of finding out what tomorrow’s announcements of AppForce and SiteForce have in store for them.